The portion of the national commentariat viewing reality from the Right has been giving Obama hell for two days now for returning a salute from a pair of Marines while holding a container of coffee in his hand. Examples at Twitchy. All this demonstrates just how few of the intelligentsia, on either side, have any real personal contact with matters military. The commentariat doesn’t realize that a salute is a honor normally exchanged by uniformed members of the military. Saluting is actually a privilege. Prisoners in the brig, for instance, are not entitled to salute. Customs of saluting vary among the various branches of the American military. 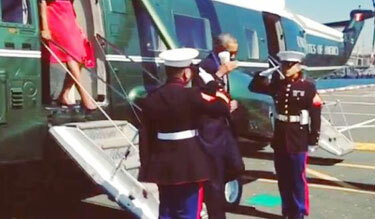 The Marines saluting Obama, like the Navy, only salute when in uniform and wearing their cover. It is appropriate for American military personnel to salute Obama in his capacity as commander-in-chief. The president, however, is never attired in uniform and moreover does not wear a cover. He is actually, in fact, not entitled to salute. It is understandable, of course, that presidents generally, not only Obama, feel a human obligation to try to respond to military salutes, but they are actually wrong, and violating proper military etiquette, by trying to salute at all, coffee cup or no coffee cup. In his capacity as commander-in-chief, any president actually does possess the power to amend military customs and etiquette and to award himself and other occupants of his office the right to return salutes when not a serving member of a military and when not in uniform and not covered, but until some president formally creates that right, they are all wrong to around saluting. Apparently, it was Ronald Reagan who started saluting. This article suggests that maybe Ronald Reagan really did, sort of, kind of, officially modify military custom. the Archives of Never Yet Melted in the 'Saluting' Category.